Has a reputation for excessive brutality in the face of usually harmless foes. HACK! is a fast paced, hilarious card game based on Kenzer & Co's award-winning magazine, Knights of the Dinner Table (KoDT). 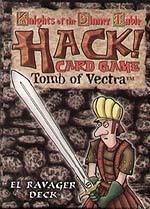 In HACK!, players take on the fantasy personas of the main characters from KoDT. Players explore the Tomb of Vectra, encountering monsters, traps, NPCs, and even new and twisted rules. The objective: find the Hand of Vectra or an exit before the other players do! Each player needs a separate HACK! deck and a six-sided die.